Imagine you're asleep. You've been sleeping soundly for hours and the night has almost passed you by. Night has a knack of doing that, of pocketing its mysteries and vanishing, leaving you alone with the morning. Opal Moonbaby is an alien. She reads minds, has a special brain dictionary, which is a bit muddled, and a pet who is a mix of six different animals. She's also Martha's best friend. Martha can't wait to take her to school- but she has no idea what will happen when they get there! Opal Moonbaby is one of the most entertaining and colourful characters I have had the pleasure of spending time with. She bursts on the page like a sparkler that never dims and you can’t help but fall in love with her alieness which makes her so naïve to the ways of the world. She is innocent, yet excitable, like a new puppy. She’s the alien version of Anne of Green Gables.Her mispronunciations and cliché confusions produce deep belly laughs with each new statement. 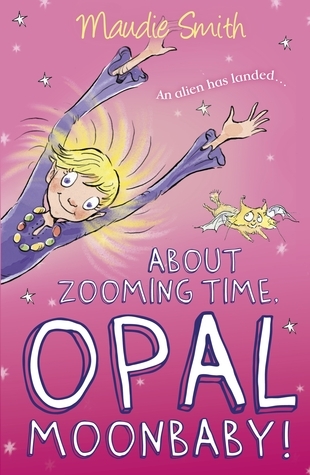 As Opal zooms from one disaster to another, you struggle to keep a straight face as such laugh out loud moments. Martha, her bestest friend, puts up with a lot. She feels responsible for Opal and takes looking after her very seriously. More seriously than Opal does. She tries to advise Opal, but Opal is having way too much fun to listen. Until it is nearly too late. I really didn’t give Martha the respect she deserved until half way through the story, when I realised how troubled she was by Opal’s behaviour and how desperately worried she was about her safety, when basically Opal was out of control. A force of alien nature! Martha is one of those children you would be proud as a parent to call your own. I loved the inclusion the Mercurials. They were very entertaining characters, especially with their long and uncontrollable hair that held all their power. I would also love a Domestipod! Opal’s imaginative dwellings should be available to buy as a doll’s house alongside the Barbie and Sindy homes. I am in awe of the powers of Maudie Smith’s imagination. How she comes up with such unique and entertaining characters and settings, I have no idea. The jokes and hilarious scenes aside, this book does have a deeper meaning. It looks closely as the theme of friendship and what makes a really good friend. 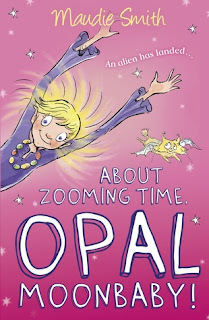 Opal realises her errors as the book progresses and goes out of her way to make it up to Martha. I would buy this series for any young girl, who enjoys comical tales and knows the true meaning of friendship. A blooming, zooming, fantabulous read!